If you outsource knowledge work, make sure the contract requires the contractor to have KM in place. A few years ago I was running a multi-day lessons capture event with a company that had recently commissioned construction of a large production plant. Here’s a story that the client project manager told at the event. “This plant was based on a similar plant built by the same contractor, and on that previous plant they had made a big construction error – in one of the emergency release lines, they had put a non-return valve in backwards. Had there been an emergency, this could have been a disaster. We spotted the error, fixed the valve, and we discussed it, together with other lessons, with the contractor at the end-of-project lessons capture session. Disaster averted for a second time, but what’s the moral of the story? The moral is that when we outsource work (to a contractor, or to an outsource provider) we are also outsourcing the knowledge of how to do the work. 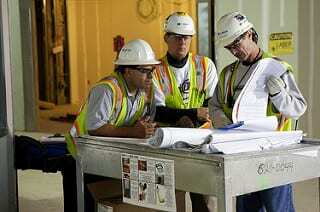 We expect the contractor or the provider to bring the knowledge needed to deliver the work properly. And when we outsource the knowledge, we outsource the management of the knowledge as well. We expect the contractor or provider to learn – to constantly improve their knowledge – to never repeat mistakes. So what went wrong on this case? Who was to fault? Obviously the contractor was at fault; they should have had a proper KM system in place, with closed-loop lesson-learning, which eliminated repeat mistakes. And there is nothing worse for a contractor than having a client with a better KM system than you – who knows your repeat mistakes before you do! However the client was equally at fault. They assumed that “Surely they would not have put it in the wrong way round again? Surely they would have learned?”. But this was an assumption. There was nothing in the contract that stipulated a KM system, and no audit of the contractors learning ability. The client just assumed, and we all know what Assume makes! The moral of this tale is that if you outsource major work, you also outsource the knowledge needed to do the work, and you need to outsource the management of that knowledge as well. Therefore make sure that your contractor has a top-notch, independently audited and verified, KM and learning system, with the sort of closed-loop learning that eliminates repeat mistakes. Make sure this “effective KM” is stipulated in the contract. require your contractor to demonstrate an effective KM approach, compliant with ISO 30401:2018. And its still worth walking the lines and checking as well – just in case!